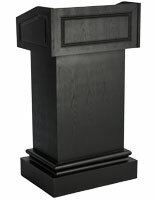 This Lectern is a Top Seller Every Month! 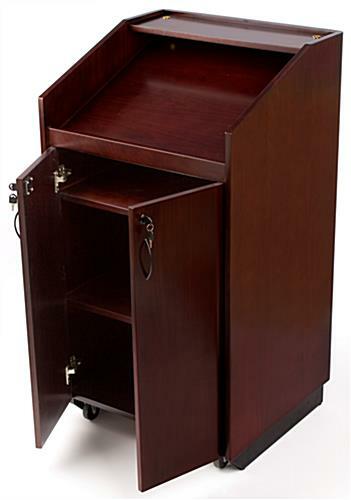 This Fully Locking Podium in Red Mahogany is Seemless to the Touch! 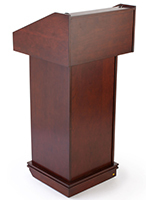 The portable exhibition lectern is a modern platform for a lecturer. 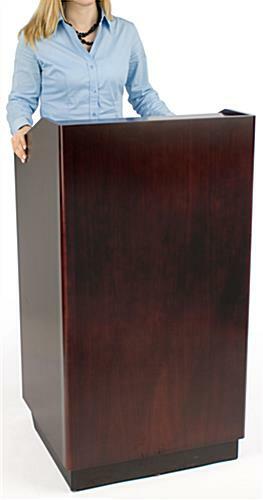 Whatever your reading aloud needs are, this portable standing lectern will accentuate your classroom or conference. 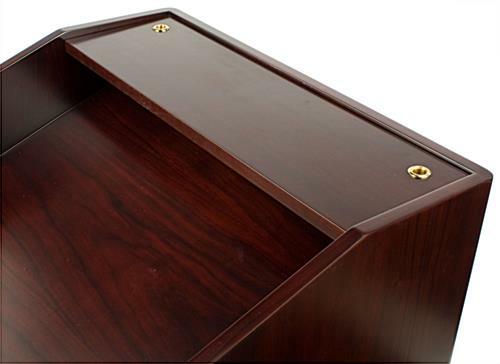 All lecterns provide a slanted reading desk to help make teaching a lecture class a little easier. 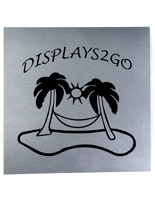 The slanted top surface has a paper/book stop for holding handouts, books, laptops or other presentation aids. 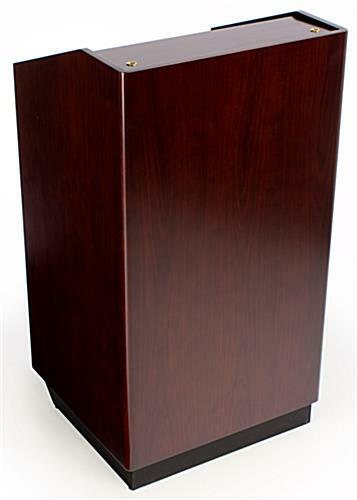 This beautiful lectern, mahogany podium, offers an outstanding quality at an inexpensive price. 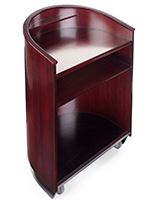 This lectern is constructed from 3/4" thick veneer finished wood. The veneer is stained and polished with a wood wax for a solid seal. 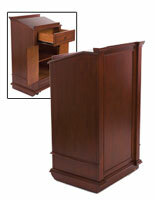 Another feature of this lectern, wooden presentation furniture, is it can hold multimedia components. 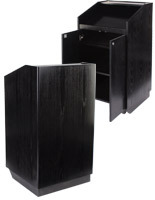 It has 3 interior shelves inside the locking cabinet, that can accommodate most audio equipment, which can be easily wired through the pre-existing cable cutouts. 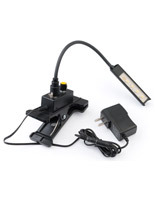 Both doors are independently lockable with matching locks, and the unit comes with (4) keys. 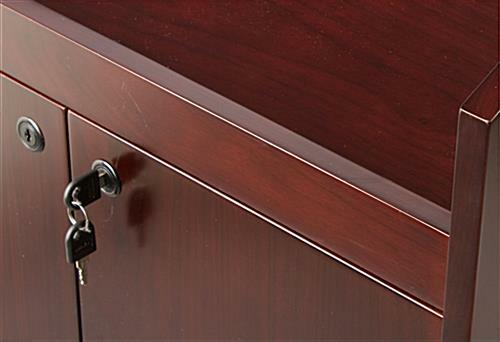 Due to the interior door hinges, the area to insert items into the cabinet is 21" wide, although the shelf itself is 24" wide. 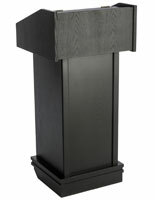 The slanted top lectern, such as a veneer reading shelf or contemporary conference furniture is a multipurpose speaker stand. 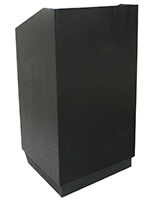 This fully assembled lectern, auditorium lectern has 2 casters to make it easily movable as well.